Menai Bridge TownThe town of Menai Bridge stands on the banks of the Menai Strait on the Anglesey end of the Menai Suspension Bridge, built in 1826 by Thomas Telford. The World’s first iron suspension bridge, it is 1,265 feet/305m long, with a central span of 579 feet/177m with its roadway set 98m/30m above the water to allow tall ships to sail beneath. A short walk from Menai Bridge town centre brings the visitor to the base of the Menai Suspension Bridge, from where the true scale of this remarkable structure is best appreciated. The Belgium Promenade (built by Flemish refugees from the Great War between 1914-16) leads south west from here shortly reaching a causeway that links Church island and the ancient Church of St Tysilio to the shore. A short walk around the church cemetery affords wonderful views of the Menai Strait, both bridges and Ynys Gorad Goch island, whose residents once made a living from the fish caught at the traps built there. The town of Menai Bridge stands on the banks of the Menai Strait on the Anglesey end of the Menai Suspension Bridge, built in 1826 by Thomas Telford. The World’s first iron suspension bridge, it is 1,265 feet/305m long, with a central span of 579 feet/177m with its roadway set 98m/30m above the water to allow tall ships to sail beneath. 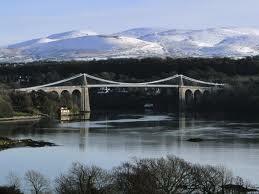 Menai bridge has a selection of interesting shops, including antiques, books and ironmongers. There is a good collection of pubs and restaurants catering for all tastes, including local seafood. A55 Junction 8A & A5.